Hot Topics > Art and the Social Model: Why make it harder? At Unlimited, we use the social model to guide the way the programme works, but we don’t insist all artists use it to frame or define their work.’ In discussion with Triple C at HOME in Manchester, we’ll be discussing ‘Whose Social Model?’ so around this we have commissioned a range of different perspectives to give us all fresh food for thought. First of these is Dennis Queen, disabled activist and DAO board member. I am a full time parent and a part time campaigner. I have been involved in the disabled people’s movement for 20 years now (give or take a couple of breakdowns and twin babies). The music I write and perform is one of a whole range of ways that I ‘do’ activism. I think it is a wonderful way to get across simple messages that are easy to remember. I am very lucky that I live in Manchester and I was trained by Greater Manchester Coalition of Disabled People in the social model of disability and the history of our radical movement for emancipation (in the late 1990s when Disabled People’s Organisations were still many and funded!). I would like to think that my love of, and loyalty to, the social model of disability is obvious in all the work I do – including creative arts. Most of my music is about disabled people and our politics and protests. I write it for disabled people. I write it to raise our power and pride and encourage people to join in with campaigns. 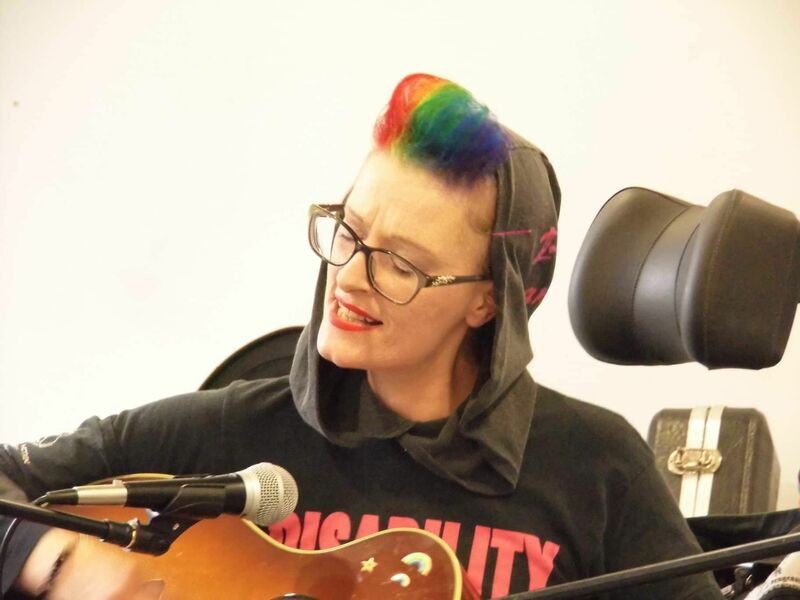 It is definitely disability arts in a literal sense – music born of the disabled people’s movement and our social model politics. I’m not a legendary guitarist, or a diva of song: I am hired for the communal messages of defiance and pride. It’s a cool niche gig if you have little time, don’t mind only performing a few times a year and are doing it for love mainly. I adore performing radical disability arts. It’s not a paying career though and artists like me are just a fraction of disabled performers and creators. We need to promote disability arts, yes but in our organisations we also promote disabled artists and access to participating in and enjoying arts. There’s much more to the story of disabled artists and access in a wider sense. Years ago before new impairments changed my life, I performed on the unsigned band scene around Manchester and the North West in an acoustic band. I found it tricky enough accessing those old venues before and there’s no way I could now. Our disability arts organisations are so important in creating opportunities for all kinds of artists to be doing all kinds of arts. I think it is ideal if those organisations are guided by social model principles, so that we can have emancipatory aims and ways of working. This means we can be always moving forward to a better place. I think whether all the artists we work with have heard of, understand, or use, the social model of disability in their own work is a very different question. I definitely think we shouldn’t fund work that patronises, demeans or oppresses disabled people – but that doesn’t mean it has to conform to a very particular academic, or political standard. You don’t have to know the social model to be fighting back or challenging stereotypes. We can use our solid guiding principles to steer away from genuinely “Tragic but Brave” awfulness, whilst affording as many opportunities as possible to a wide range of artists. It is our job in disability arts organisations to help artists find ways into an extremely excluding arts world. There are so many disabled artists out there with talent doing work totally unrelated to disability as well as in fringe communities. We are all kinds of artists. It would be a shame to not be working for those disabled artists too. Insisting on all disabled artists displaying accurate knowledge of the social model of disability would be elitist and unfair – it is exactly everything we should be breaking down. The world of arts is already so excluding to so many artists. It’s worth remembering here that even in the world of activism we unite around campaigns, not just academic descriptions of concepts. Back in the days of D.A.N. I suspect only half our number could describe the social model. The other half did not give a hoot because they can still tell wrong from right. How else can we include people who are new to politics and people who are learning disabled, or Deaf people and people from multiple marginalised communities who have rubbish access to information? Why make it harder to join in? A much better focus would be how we make it easier to join in for more disabled artists, especially those who are multiply marginalised and / or from grassroots communities. I think the ideal way is using our organisations strong political basis to promote the diversity of disabled artists AND of disability arts and bring us together so we can learn from each other. Making the social model available to people whose arts might benefit from it and more skills accessible to grassroots artists. This is what I think we try to do at DAO and it’s what Unlimited try to do also. As a new board member of DAO I am looking forward to doing my bit to help keep pressing forward and bring this ambitious agenda closer to reality. As I finish off this article I am still heart-aching. I found out yesterday that Natalie Markam has passed away. The news that Mike Oliver has passed is still only a few days old. The news that Katherine Araniello has also passed is only a couple of days older. I can’t decide if this makes writing this harder, or just more essential. It certainly feels a bigger responsibility. Mike Oliver: The activist famous for his work on formalising the guts of the Union of Physically Impaired Against Segregation’s document “Fundamental Principles of Disability” into a neat model we can use in our campaign work: “The social model of disability.” I was overjoyed to finally meet Mike and Joy Oliver recently performing in a show he organised for Kent University’s International Day of Disabled People celebrations. Mike was a great lover of disability arts – his political work has informed the whole genre of disability arts. I was honoured to serenade him with ‘Taking Liberties’ by Ian Stanton as I know he loved Ian’s work. Katherine Araniello: how does one adequately describe an artist so vibrant and perfect – so radical and earth shaking? Katherine’s work was unique and was heavily informed by her strong and uncompromising social model politics. Katherine’s deep understanding of irony and humour makes even the hardest of politics easier to swallow. I adore most of all Katherine’s songs- my two favourites are “Take me to your party” and “Sick crip blues” which is running on a loop in my head right now. Natalie Markham: one of the funniest disabled women I’ve ever had the pleasure to do cabaret with – her performances in the Nasty Girls were absolutely legendary. Her work enabled a generation of local activists to learn including myself. Also a wonderful leading figure in Greater Manchester Coalition of Disabled People, Natalie’s staunch social model politics informed her work in organisations and the world of arts. Without the social model I wonder how the arts of Natalie and Katherine would differ. And where did they start?